Happy Warm Holidays Everyone ! In this post I presents to you my Secret Green Santa Gift . 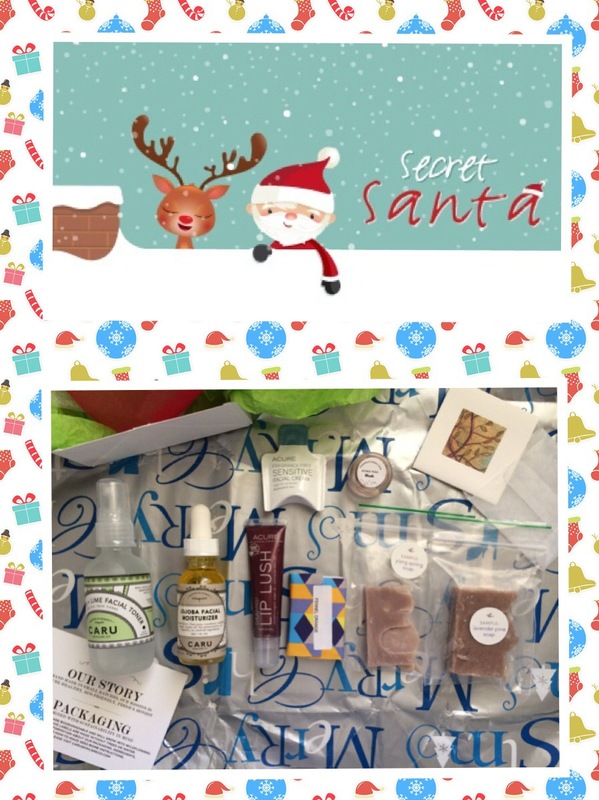 Back in Late summer in August I started the Secret Green Santa 2014 for the green community. 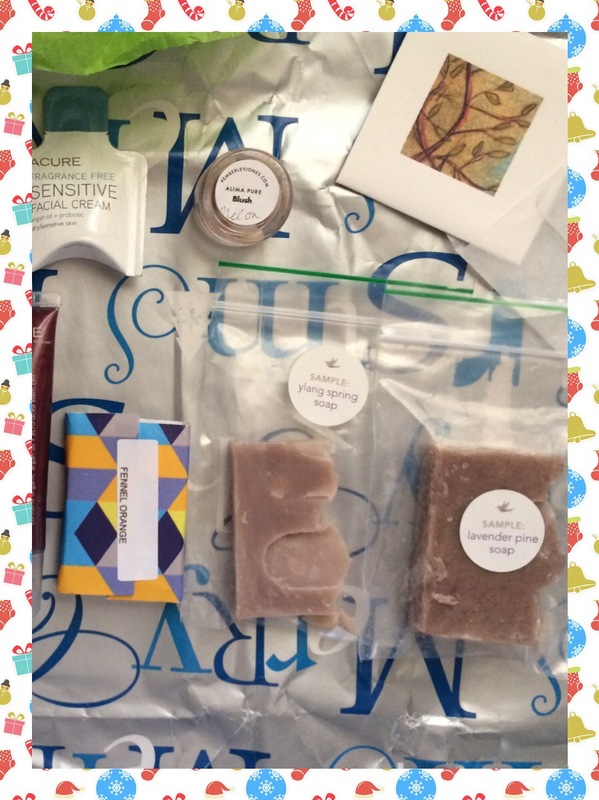 Pretty much its a gift swap among green bloggers & You-tubers. This was actually my first time organizing it but glad to say that it was full of fun ! Me & Five other green beauties team up to swap gifts. The gifts where to be a up to $35 value . Note: Come back as I will update this page to links to the other Secret Green Santa box”s as soon as they get posted !!! My Secret Green Santa was Linda Aka @lindaouk. Note: Just to mention those that join the gift swap got to give a Five brand list to their Santa that they wanted to get . In it was a lovely cute Leave note card (seen in Top Right) . The first thing I notice when opening the box: Soaps!! In my list I mention SOAPS & Linda got me just that 🙂 , a mix of soap scents form my favorite brands . The soaps where Osmia Organics : Lavender Pine & Ylang Springs. Meow meow tweet Fennel orange . I love the scents of each one , which makes sense now why the box smell so good! Even the the mail man was like ” what a lovely smell box you got” LOL. More Goodies …..these are Big ! 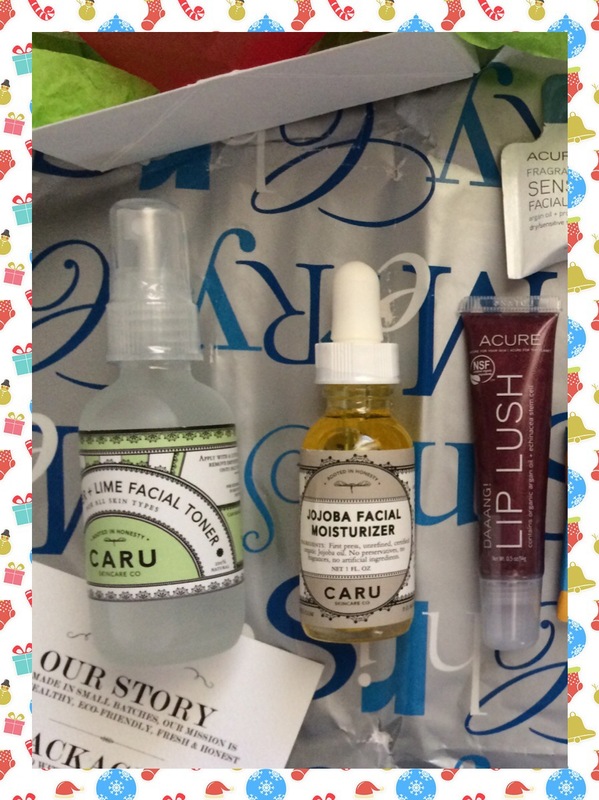 Next up, I found in this green box where Two products by Caru Skincare Co. I got the Jojoba Facial oil , which I love due to its many form of use . This couldn’t come in better time as I just finish my travel sample size :). It came pair up with Cucumber + Lime Facial Toner . Another products that I need as I just finish my current Toner. So excited to have these in my life as both where needed ! Next and Last Item is another Acure Organic product . This time its the Lip Lush in DAAANG! Super excited to get this color as its a great fall & winter lip color . Santa LINDA Thank you So Much!! Thank you so much Linda for the beautiful and exciting gifts . I love every think so much that I don’t know what I will use first ,LOL . I also want to thank you for supporting a local business at my home Town in PA ; PemberleyJones.com online green store . That made this gift even more special to me to know that a Green & local business was supported !!! Thanks to PJ for helping out Linda picking out the goodies , a PA love to another PA girl !! Thank you everyone that took part in Secert Green Santa 2014 & for making it a special One !! ← Merry Christmas To All & Thank You ! It was so much fun shopping for you. Thanks for organizing and letting a non-blogger take part in the fun. Your welcome Linda, so happy you took part. Thank you for. Taking part and for the amazing gifts that will be much use.